In the last few weeks, I have been particularly struck by very young people’s concern for the future of the planet. I had a very interesting conversation with my 13 year old granddaughter, Lily, while we were on holiday together. She is so well informed, deeply concerned but without a trace of the usual teenage melodrama and very anxious to do her bit to help. A week later, we were exhibiting at Vegan Life Live at Alexandra Palace – there was a wonderful cross section of society attending, but again, I was so impressed with how the very young were so engaged with the problem. All this, of course, brings me to Easter and our vegan Easter eggs, and how glad I am we made the decision 12 years ago to produce vegan raw chocolate and fudge. So..a very special flash offer for Easter. From now until midnight on Sunday, 7th April we are giving away a free CLASSIC EASTER EGG (worth £10.95) if you order £20 or more during this period. 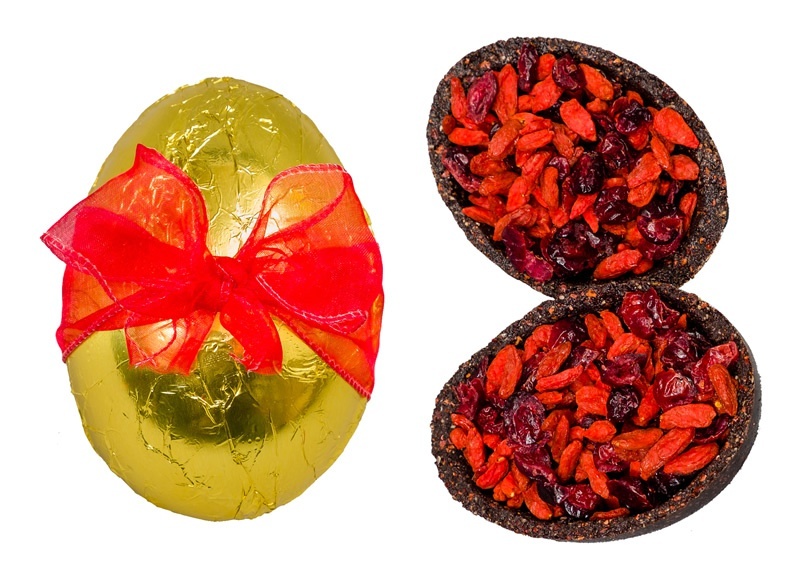 Our CLASSIC EGG is made to the same recipe as Naked Pie and its centre is packed with a mix of organic cranberries and goji berries which have been dried without sugar. It weighs in at 150g. In 2017, The Sunday Times Style Magazine voted CLASSIC the best healthy Easter egg. Two things to remember, all our eggs have a 6 month shelf life and orders over £20 are postage free.